The Rock Climber’s Training Manual has been sent to the printer! That means as far as my contributions are concerned, the book is “done”. According to the guys at Fixed Pin, it normally takes about 3 months from the time the book is submitted to the printer until it arrives on bookshelves. The cover spread. Mike took the cover photo of me on To Bolt Or Not To Be at Smith Rock. Click on the photo to read the awesome praise on the Back Cover from our early reviewers. Once the printer has the electronic file, they scan all the pages to ensure everything is of sufficient resolution for printing. Then they will select 16 “representative” pages and print these all (in color) on one giant sheet of paper, which they will air-mail to Fixed Pin. This will give us one last chance to review the colors and make sure everything looks “right”. If we see any problems, we highlight them and send the sheet back to the printer. Once they get the green light, they’ll configure the press to begin printing books. Once the presses start running, the first book off the press is over-nighted to the publisher, and we have one last chance to “stop the presses” before the full run is completed. Once the books are printed, they’ll air-mail a small quantity of books (which are mostly used for promotional purposes), and the rest are boxed and put on a ship. A large portion of the “3-month” process is consumed by the cargo ship crossing the Pacific Ocean. If we’re lucky, the books clear customs without any snags and then they will be ready for distribution. 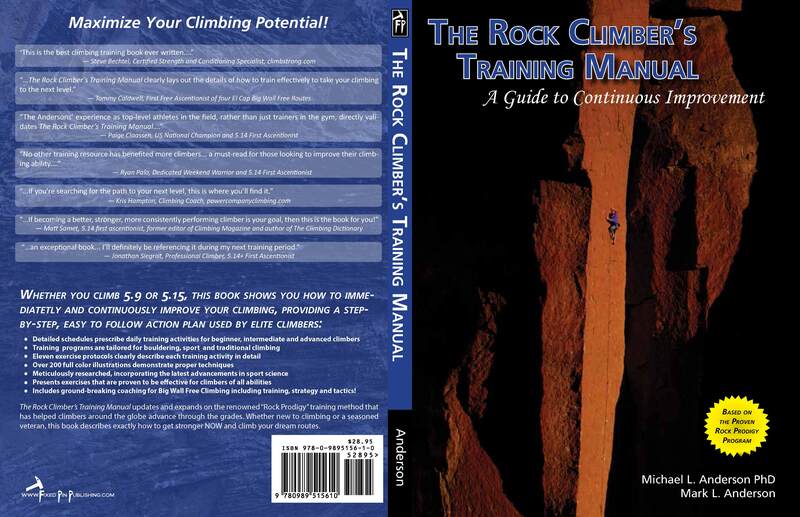 The Rock Climber’s Training Manual is NOW AVAILABLE!!! Wow looks great! Can’t wait to get my hands on a copy. Will there be pre-ordering? I believe there will be pre-ordering, but it will be a while before that is available. I will let you know when you can pre-order.